After fleeing a cult, Martha struggles to assimilate with her family and society because she’s haunted by painful memories and increasing paranoia. Young director and screenwriter Sean Durkin is a new sensation with this movie and for good reason – this is a fine example of the spirit and craft of a great American independent film (the Sundance Institute helped finance it). As a result of his skilful direction, the movie flits between two completely opposing worlds – a backwoods commune and a luxurious lake house – effortlessly, with memories recalled through sound. 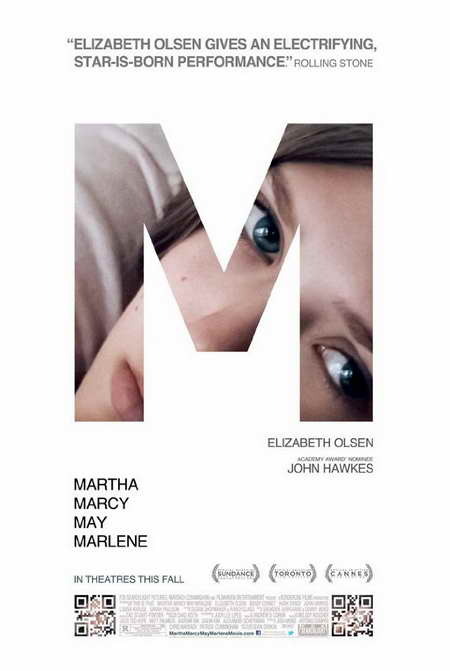 Patiently, subtlety, Durkin creates an unflinching portrait of cult life that resonates with Martha’s increasingly odd behaviour in the present, creating a suspenseful and vivid portrait of a troubled soul. I was on the edge of my seat for every minute of this film, expecting something horrible to happen. John Hawkes as the cult leader is a believable ‘messiah,’ so gently persuasive with his warped ideas that almost make sense, that you can see how he could win over naïve hearts and minds, even as it raises the hair at the back of your neck (and potentially your ire). However, it’s Elizabeth Olsen as Martha who is particularly fantastic. That said, “everything” – direction, the entire cast, the script, and the technical value – is stellar. This is absolutely one of the best films I’ve seen in a very long time. And you will remember the unwieldy title after seeing it.